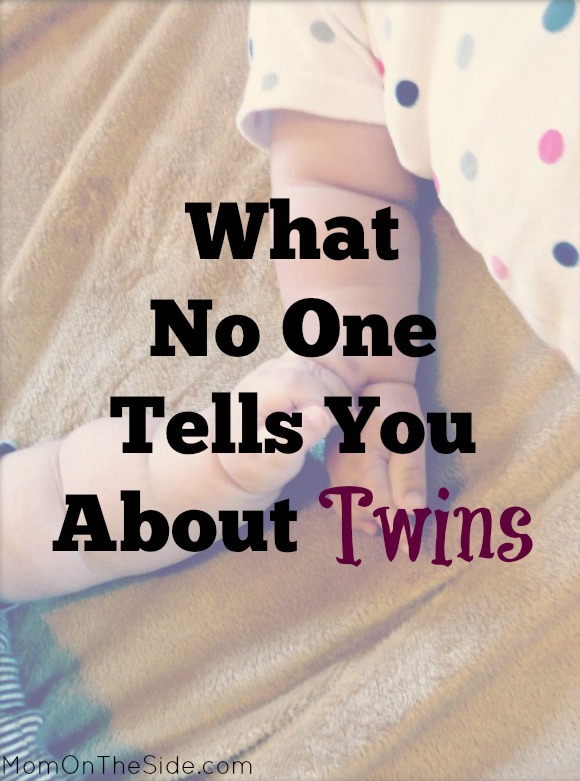 Ever wonder what no one tells you about twins? I read all the books about twins, talked to other moms of multiples, and spent nights browsing the internet. 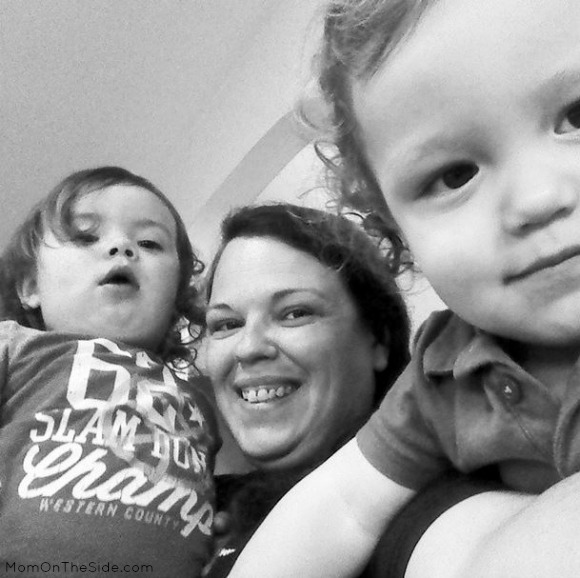 I wanted what every mother wants when bringing children into the world…to be prepared. For the most part, I was. I’d raised two kids already and knew it was going to be hectic, crazy, and extremely rewarding to raise twins. But, there are things no one told me, or maybe it’s that their boy girl twins didn’t do these things. 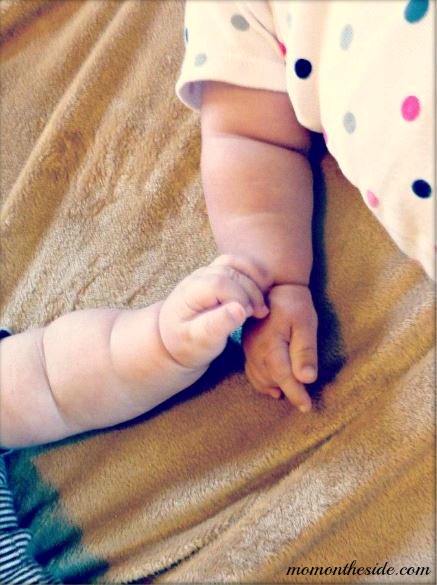 Having a twin doesn’t mean you have a built-in best friend, at least not early on. They may not care for each other at all. They may yell at each other in their twin language. Push each other down in frustration. Cry tears of jealousy when they other is on your lap. Don’t get me wrong, our twins have moments where they love each other, but most of the time, they just want the other out of their space. This is a recent revelation for me. I wondered why Monkey Girl was waking up early from naps to play babies in her room lately. Why Slobber Monster is starting to push Monkey Girl away during story time. Since birth, they haven’t really had “alone time”. Can you imagine always having someone by you, talking to you, in your face, and taking your things? I know I would get annoyed and even though they still need supervision, I’m sure they’d also love a few minutes to just be. A few weeks ago I was curled up in the bathroom bawling crocodile tears to the point of hyperventilating. It was 2 pm and the twins were in the bath after covering themselves head to toe in Vaseline. Prior to the Vaseline they had climbed on the TV Stand four times, dumped out every toy bin, taken each other’s diapers off and pottied on the floor, and climbed on the kitchen counter twice. I was defeated and it was time to step up our childproofing for adventurous, exploring, dare-devil toddlers. How did that happen so quickly?! Having boy/girl twins poses some interesting situations, especially as they begin to realize they have different body parts. At diaper changing time, the other runs to the end of the changing table to watch. In the bath, they notice different parts and become curious. It’s all part of growing up and discovery, but be ready for it, especially if you have boy/girl twins like us. Even though they aren’t the best of friends, Slobber Monster and Monkey Girl make quite the duo when teaming up against mom or dad. They help each other remove their clothes and diapers, set up toy traps that we usually find in the darkness, run in different directions to climb on furniture at the same time, and the list goes on. My only hope is that as they get older, they team up when it matters. Other than cribs, I wasn’t going to buy two of something just because they were twins. Then they started fighting over the same toys and books. Since then I have bought them both the same gifts. Baby dolls, toy airplanes, even treats. They still fight over them and want what the other has….even if it’s the same darn thing! So it really doesn’t matter if you buy one, two, or three, in the end, it’s the fact that the other has it. What things did you learn after having twins, that no one told you? Wow. I think you’re going to have your hands full once the teenage years hit! Thanks for this great post. My 14 year old sweet boys are much easier than when they were young. It’s my 8 year old daughter being a teen that scares me.. I have a friend with twins and the kids don’t seem to like each other at all. I hope they grow out of it. Thank you for sharing Steph! I hope my twins have the same outcome as you and your twin. 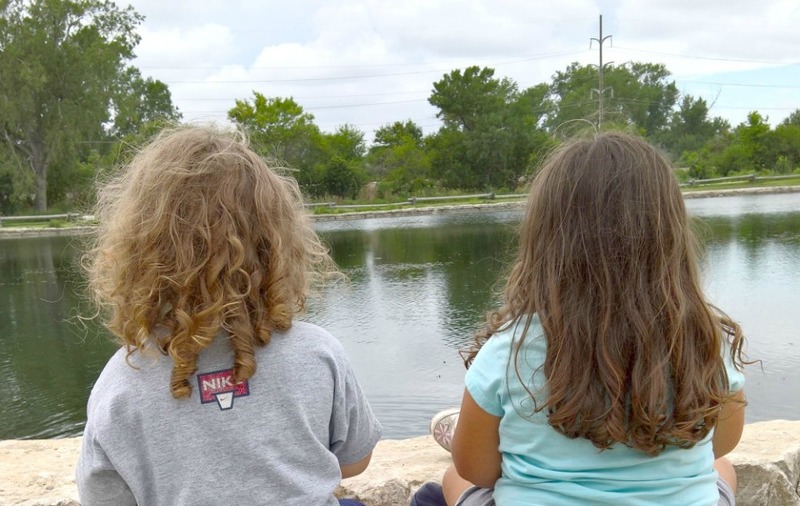 Unique learning experience that twins have….that’s for sure….and one that I have enjoyed watching. I love my twin! Sure we fought like cats and dogs but he is my best friend, my hero, and my person! I cannot imagine my life without him. We even went to uni together! I know you say that twins aren’t best friends, and yes that may be the case now but just wait until one is having problems in school with friends. The other will be there to support them in a heart beat. I think the saying is “I can fight with my sibling all I want but the minute you put your hand on them you have to deal with me”. There really is nothing quit as special as being a twin. They definitely will…. a good example is how they gang up against anyone who trys to hurt their twin or looks like they want to hurt them…. they will argue alot but one thing is for sure, the love they have for each other is unbreakable. I love this post and will share it with my friend who has twins. I know she will appreciate it. Happy new year to you and your family! It sounds like you have your hands full. I always wondered what it would be like to have twins. Oh my goodness. How cute are they?!? This is such a sweet (if not enlightening) post! Thanks for making me grateful that I don’t have twins! Although, I think when they grow up it is great of they are best friends. I do wish my son had that. Having twins sound rewarding and challenging. 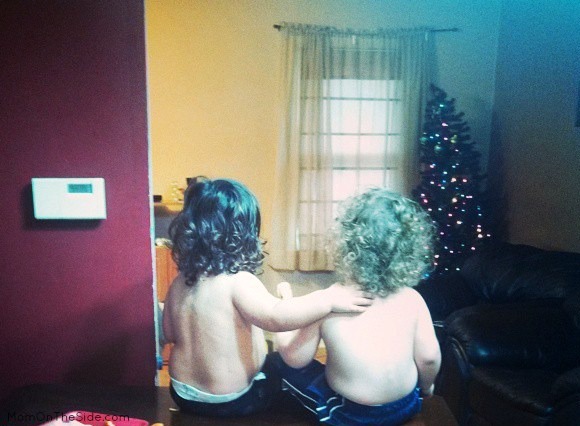 It will be interesting to see how they get along in a couple years….hopefully they’ll be friends for life. 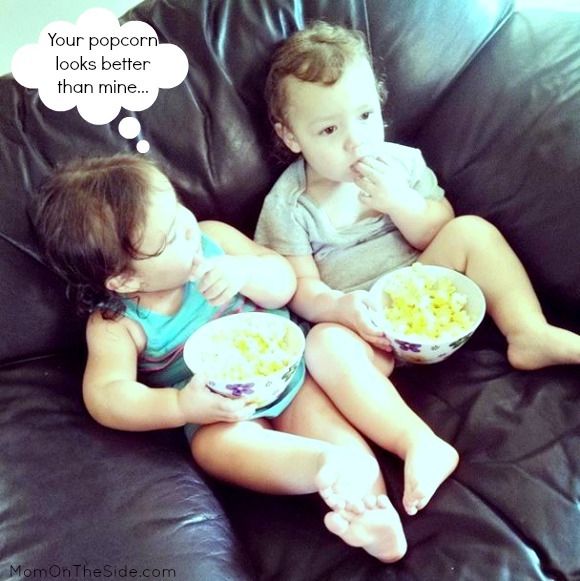 My son and daughter (not twins) fought like crazy when they were younger–made me nuts! !–but now they are the best of friends. Your twins are absolutely precious! Now I don’t have twins but I have Irish twins (not even remotely. The same I know) but a lot of this is them too! Although tough and Rewarding I bet it’s the most incredible! My twins fought, griped and carried on with each other. BUT anyone else cross one and the other jumps all over it. I can’t imagine how difficult it is to do two at the same time. I had a heck of a time with just 1. But twice the love is a bonus! For some reason, I just always assumed twins would get along. Thanks for clarifying a lot of things for me! Ha!! My mom is a twin, but that was years and years ago – so I’m sure things have changed. Yours are just precious!! What a list of things. My two (not twins) have made me cry in defeat too. I think it’s the job of kids at some point in life. Let’s hope ours do it early and no teenage tears. I’ll be thinking of you and myself. Good Luck! lol at the picture of them sitting up high. Your twins are sure cute! Happy new year to you! They are climbers for sure! Anything and everything is a ladder! This was a fun post to read. I’m not a parent, but this I found insightful and delightful all at once. I love these pictures. You have a beautiful little family. Good information! I cannot even imagine having twins when I had kids. They are adorable. think it would be amazing to have a twin. Love the honesty of this post. You are doing a great job mom. It might not seem like it some days – but you are. ‘They Will Team Up Against You’…. Yeah. That! LOL Although, I’m willing to bet, people with more than 1 small fry have this shared problem. Hang in there! Double the kisses, hugs and love too! Such an awesome and honest look inside your life! Thanks for sharing! YOU GOT THIS! I have two year boy/girl twins too. The only two things they always agree on: their older brother is the coolest and their little sister is the interloper! That’s it. My twin boys will be ten and I’m still waiting for them to “grow out of it”… They really are the best of friends (although they will never admit it, so and so at school is always going to be cooler) they can definitely be arch-enemies (even though both are batman and the other one is lex luthor). In the end, it’s always a sneaky tag team against the parents, so as much as I can’t stand their fighting, I know twindom wins in the end… hang in there, even when it seems unlikely, they will be the others biggest advocate. They truly are a double blessing! Thank you for the great words – sneaky tag team for sure!! I hope mine will be big advocates for each other as well – I hope that for all of my kids. Double blessing indeed. i don’t necessarily think this goes for all twins, it seems to be more of a issue with twins that are boy/girl than boy/boy or girl/girl. I have a cousin who has twin boys and a friend with twin girls, and I’m having twin boys this next week, and their children get a long great. They both have told me that they haven’t experienced what you listed. But like I said it could be a boy/girl twin combo thing becaus their different from the start and have different interest. It could be a girl/boy combo for sure – I don’t have many friends or family with that combo myself. And based on the date of comment your twins are around 8 months old -congratulations!! I hope you are getting some rest at this point – enjoy every minute! We have three sets of twins in my family (fortunately three different generations) – two boy/girl and one boy/boy. The boy/boy twins are super close but also argue and fight all the time too. Lots of roughhousing/wrestling/injuring each other way past the toddler/childhood stage into adolescence. I don’t think any of that negates their closeness, just… twins, dude. Twins. It’s a whole different thing from single kids. I have twin girls- almost 8yrs old and some moments they are best friends and the next screaming at each other for certain toys, movies to watch and now it’s clothes and shoes. I have had the struggle of them wanting to get out of the stroller to be big girls and walk in the store just for them to run from me in opposite directions to play hid and seek with me…this is not fun in the middle of Wal-Mart!!! One lady with newborn twins asked me when it gets easier? I told her to give me her number and I will call her when it does!!! It’s a struggle at times but I will never stop loving my love bugs!! Your girls sound just like my twins! They can never agree on a movie, always want the others toys, and oh lordy the “fun” we have in stores. I just go alone at this point because they won’t even stay in the cart/stroller/wagon lol! i have boy girl twins and I can relate to alllllll of this. No one tells you things like this but they are seriously all so true! Oh my gosh the relationship with poop -I feel you! I’ve never seen anyone fascinated with another’s poop until my twins. Mine are now almost three and while they have out grown somethings, there are all new struggles. twin mania – you are not alone and I love that phrase! Thank you so much for your comment Leann – it means a lot and touched the heart. As far as dressing them alike – hubby ruled that out from the get go – but they do love to wear each others clothes! 😀 I’d agree on the different bond and I love watching it grow between them. Great things to know for the future! I have b/g twins that are 11 weeks old and they are already complete opposite. She is loud and wants constant attention while he is quiet and laid back. The pediatrician just warned us about them teaming up and to expect it soon. Can’t wait. they already keep me on my toes. Oh my gosh – 11 weeks?! Well, know they are a around 5 months old! Those days are so fun, yet exhausting!! Hopefully you still have a few months before the teaming up begins. I don’t agree with the majority of this article. My identical twin girls are 5 and have been best friends from the start. Of course, they disagree and fuss but those occurrences are fewer than the times they spend playing and laughing together. Two of everything, for the first 4 years, absolutely yes. Would you buy your singleton half a toy? Now that they are a bit older I buy two similar toys, like a pink doll and a purple doll they choose but those first few years we bought two identical toys, one whole toy for each child. I have tried to have alone time with each girl and that time is spent answering where their twin is and why they aren’t with us. They are much happier together, they have never know life apart it’s natural and normal for them. I do agree they will leave you defeated and in tears. They are the best tag team ever. Maybe the difference in our experience is fraternal vs. identical twins. I wonder if it is fraternal vs identical or boy/girl? Could just be their personalities too. The thing about toys that drives me nuts is when we shop, they get to choose. But when we get home the other gets mad they don’t have what the other has. I’m not buying two of each just to be safe – they have to learn patience, sharing, and you get what you choose. Alone time is the same for us right now! We are working on it more and more as we get closer to preschool. Thanks for your comments – it’s always nice to see the other side! This post was really cool to read. I myself am a girl/girl twin of 16, we are fraternal, and although the situation is different to yours, being a twin is the most amazing thing. For me, I always have a friend to talk to, to ask questions or to confide in. She is honestly my best friend. Luckily we hardly ever fight, and if we do, its over pretty quickly. Recently I was asked how long we’ve spent away from each other, and i really had to think hard! Turns out it was just this year when I spent 4 days away at a camp!! We have such different personalities and body types, but are the same at the same way, and we developed this sort of unspoken rule of each others “things” i.e., She is really into sport, so I don’t really involve myself with that, and I am involved with lots of music, so she doesn’t interest herself with it! There is something so special about having such a close bond with someone that is so hard to describe. I don’t know what i would do if i didn’t have her by my side 24/7. I hope you enjoy the experience of being a parent to the troublesome-two! Twin 2 thank you so much for commenting and giving me some insight into what my twins will be experiencing in the years to come. I love that the two of you are different, yet alike, and bond over it all. I really love your last comment – I need to frame that! I’m still wondering if I will survive at this point. It’s getting easier and harder at the same time. How is that possible?! Love the idea on the alone time too – we are doing more of that but still getting the “where is Oliver/Charlie” when we do. Thank you for this post! We are expecting twins this Spring, and this gives me a lot to think about…like to remember they may not get along and that’s okay for a season. And the alone time suggestion is great. I’ll have to remember they may not want to be in one another’s presence non-stop. I keep thinking that will help calm them as newborns, one another’s presence, but I’m sure there will come a time when they need some space! Thank you for this! God bless your family! Aw – good luck with you upcoming arrivals! I’m glad this post gave you some things to think about and it really is an amazing adventure, even among all the craziness that is taking place. If you ever have any questions or just need to chat at 3AM, come on back! A year later (I wrote this November ’15) and it is also being proven wrong for us now lol! They want the same thing regardless of what it is, and they are boy girl twins, so it’s funny when Mr. Oliver wants Miss Charlie’s dress! Great list! I also have boy/girl twins (2yrs old) and I’ve experienced all of these things!! Their jealousy and hatred for one another has often made me wonder what I’m doing wrong so I’m glad to see I’m not alone!! Here’s to less crocodile tears in the new year! Isn’t it fun?! Some things have changed in the past year so I should probably do an update post now lol! And yes on the less crocodile tears indeed, they are far less now! I just found you on Pinterest and I love this post! I have 20 year old identical boys. And your post made me laugh out loud at the memories it brought back! My boys teamed up to remove each other’s poopy diapers. So I had to start using duct tape to keep them on!!! They mostly got along, but had the typical sibling fights. They are good buddies now, but not best friends. They live in the same college fraternity, but rarely see each other. That is a good thing. It was important for us to show them that they are individuals–but that they also have a responsibility to their brother. Welcome!! 20?! i bet you have lots of tips to share too! 😉 This part is SO true “It was important for us to show them that they are individuals–but that they also have a responsibility to their brother.” and I love your rule, I may have to steal that for my own twins lol! It’s so good to know neither of us are alone in what we are experiencing, and that we will survive this. 😉 I’m okay with alternating, as long as there is still lots of love there. Love this post! My boy/girl twins are 21 months and boy can I relate! For the past month life has been full of days feeling defeated but then there’s a moment of clarity! I know it’s par for the course but I really just don’t know how I’ll get through it. Soon enough I’m sure I’ll miss these days so I’m trying to stop and breathe right through it! Thank you for sharing because boy is it great to hear that it happens to everyone! They are turning four next week and there are more clarity days than defeated days now. I still don’t miss these days yet, but that will come. Breathing is a practice I have mastered as well lol, that and making sure i”m getting me time because it really can be mentally and physically exhausting some days, as you know. Hugs and I hope you are having more clarity days!! You are 100% right, the adventure doesn’t end at any one point! It’s a relief to hear that my twins aren’t the only two at each other’s throats. They’re 17 months, identical girls, and I’m usually a referee more than a mom. The biting, smacking, screaming, shoving…By 3-4pm, I’m ready for bed. They’re so in tune with each other, though, that when one cries, the other will start up sensing the distress. Diaper changes are interesting because my one will watch while I change the other. Curiosity at its finest! Their tastes in foods are different to some degree too, which makes feedings more work having to make meals according to what they like so they’ll eat. They follow each other around, but at the same time, fight when they’re together. But when they’re going in opposite directions, I know all h*ll is about to break loose. I am grateful that I have two older children, one who is almost 13 yrs and he’s an amazing extra set of hands when I’m desperate. Thank you for sharing your experiences! Having older children does help! My twins are now four and my older two are 10 and 15 although the 10 year old is more of a handful than the twins sometimes! I hear ya on the opposite directions too! When I take them to the parks solo, I try to stick with ones that are fenced in lol! Wow!!! I’m currently 24 weeks with twins Boy and girl. This scared me a little bit ha ha!! Thank God mothers coming to help . Please don’t be scared – mine are now four and I’m still alive! 😀 And yes, thank god for mothers and if you ever need to vent or ask questions you can always come here! My twin boys are four now and I find all of this accurate. I’ve got boys pulling each other’s wieners in the bathtub now. Never a dull moment, right? On the subject of opposite gendered kids: My brother and I were not twins (2 year age gap) and I remember bath times being very interesting! Lots of conversations about peepees and butts. I have 10 month old boy/girl twins and 2 older children. (12 and 13)Most of this article is right on point. Even now, they are taking things. If she has her bottle, he will take it. (even though his is in his other hand.) If one of them is in my lap, you can bet the other one is headed my way too! Yes, it is true that my hands aren’t just full, they are overflowing….but, the same can be said of my heart. My twins were a suprise blessing, but what a blessing they truly are! Now, I can’t imagine my life without them, and all the chaos that includes! I absolutely loved this article and can totally relate. I have twin boys and have crazy days like that all the time and sometimes when I am describing my boys I described them as a blessing but also crazy like no other of course I would not change it for the world but there are days when I can get nothing accomplished and just seems like I’m going 10 steps forward and 10 steps backwards and yeah I agree don’t buy separate toys It’s important for kids to share and take turns.. thank you for the laugh and not making me feel like I’m the only one .